It's a great day for horse racing. Some of the world's best horses, representing 16 different countries, have been keeping cool in air-conditioned quarantine stables at Nad Al Sheba Racecourse in Dubai, capital city of the United Arab Emirates. They will be on the track today for the world's richest day of racing: more than $20 million in prize money is at stake in the Dubai World Cup. You might think that I'll be down at the pub with the big-screen high-definition television monitors to watch the races...but you're wrong. The Dubai World Cup will not be televised, except on the subscription-only racing networks for handicap aficionados with dish services. So instead of explaining horse racing to the folks down at the pub, I'll be huddled over a computer monitor, since ESPN just announced that they will "broadcast" the races live on their espn360.com web site. Make no mistake: the world's best horses, including the world's #1 racehorse (2007 Horse of the Year Curlin), will be running for more than $21 million, but there is not enough of an audience for television coverage by a network. There is enough of an audience (ESPN believes) for a live broadcast of the Florida Derby from Gulfstream at 5 p.m., presumably because it is one of the final prep races for the Kentucky Derby. People will watch poker, though. I'd rather watch Curlin. 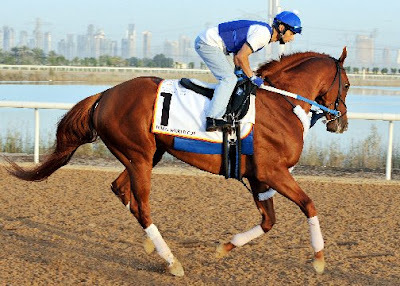 Top American racehorse Curlin is the overwhelming favorite to win today's Dubai World Cup. If your internet service provider has an agreement with ESPN, you can watch the races live today on espn360.com. The Hoofcare office has Verizon dsl, which is an ESPN internet partner, so I can watch. The races start at 9:30 EST, with the Big Race going off around 1:30 p.m. EST. I think there is a nine-hour time difference, so do the math: these races will be under lights. Let's hope Curlin's a night owl. Two interesting factoids about this day of racing: admission to the racecourse is free to the public. And there's no betting. Photo of Curlin by Dave Harmon, courtesy of Dubai World Cup Media Centre. Thanks! Ah, but now that I have FIOS, I finally get both TVG and HRTV and get to actually watch the races. The Dubai World Cup...it's not just for dish anymore! Of course, the fact that it's getting zero coverage in the North American media doesn't help...I also wish it were at least on ESPN. I'm shocked that you don't have at least TVG Fran. Saturday made for a nice morning even though the races started at 6 something pacific time. I do have to say that I was on the fence in January when Curlin was named "horse of the year", but I am there no more. The world cup was over at the 600 meters. He is a stone cold race horse and I'm sorry I ever doubted him.